Inside the school campus, proceed slowly past the Mead Amphitheater and the Auto Shop building on your left, driving at 5mph. Then make a steep left turn, going uphill to the top parking lot. You can park anywhere in that lot, but only after school hours (4pm or later on weekdays, or when the shop is open on weekends). The wood shop is Room 416, a yellow stucco building adjacent to the top parking lot. You can also enter the campus through the entrance on Gomez Avenue, off Miller Avenue. See the alternate path on the campus map. If you are lost, email info@tammmakers.org and/or ask for Geo Monley, who runs the shop. See campus map below, with the access routes shown in green. Note that you can only park by the wood shop outside school hours, after 4pm on weekdays — and on weekends. Otherwise, please park in the school’s main parking lot on Miller and walk up to the wood shop, using these general directions. 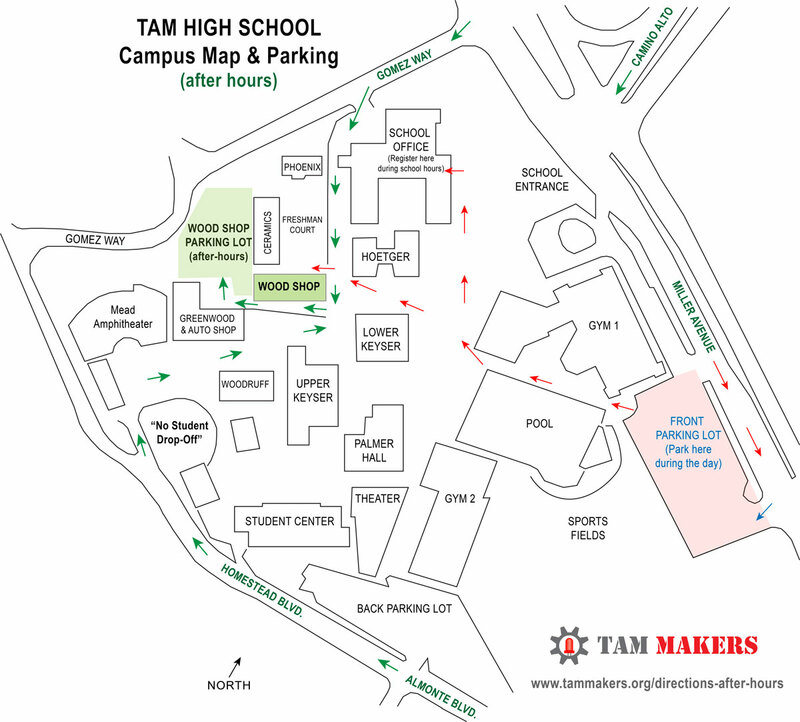 If you come during school hours (7:30am to 4pm on weekdays), you will need to register as a visitor with the school office, as shown in the general directions map. Here is the Google Map link.